This week (and into the weekend), check out these events that are taking place in Dallas, Texas; Kansas City; St. Louis; San Francisco; Sandy, Utah; Victoria, BC and Houston. The dog days of summer bring Dollar Days in August at the Arboretum. Throughout the entire month visitors can enjoy general admission for only $1.00. As always, members receive free general admission and parking year-round. This is a perfect opportunity for new Arboretum visitors to bring the kids out to experience the eight-acre Children’s Adventure Garden. For just an additional $1.00 per person, guests can enjoy a summer day filled with wonder and excitement! Parking is not included (can be purchased online for $8.00) and offsite parking shuttles are unavailable. For more information, visit the Dallas Arboretum. Cap off your work week with top local bands and favorite food trucks. Shop the wares of Kansas City artisans and finish the evening with a famous movie under the stars at Crown Center Square. This Friday, listen to the tunes of The Magnetics and finish the evening off with Disney’s Frozen (Sing-A-Long). The festivities begin at 5:00 p.m., followed by music at 6:00 p.m., with the movie starting at approximately 9:00 p.m. Free admission. Of note, outside alcoholic beverages and pets are not permitted at the event. For additional information, contact 816-874-8444 or visit Crown Center Kansas City. Kansas City and the Crown Center WeekEnder. Take part of downtown St. Louis’ 11th annual Downtown Restaurant Week where over 20 of downtown St. Louis’ finest dining establishments take part of this fabulous food events. Locations include 400 Olive, Lucas Park Grill and Market and Robust Wine Bar to name a few. Just show up to one of the participating locations and select from a special 3-course dinner menu for $25.00 per person, plus tax and tip. For more information visit DRW. Outside Lands also features attractions that focus around food, wine, and art. There is a wine lands portion of the festival that allows people to purchase tickets and sample wine from many different vendors. There are also areas that offer separate entertainment, including a sports lounge, an arcade/bar, and various food and art vendors. The festival is designed to utilize several strategies of being eco-friendly, as well as to educate the public about eco-friendly movements. There are solar power stages, a refillable water program, a waste diversion program, a recycling program, and bike valet parking program. There have also been workshops to educate about organic food and farming. For more information, visit Outside Lands. See a sky full of hot air balloons at the annual Sandy Hot Air Balloon Festival. The sunrise balloon launches happen both mornings. The first wave launch around 7:00 a.m. and the second wave around 7:30 a.m. (wind and weather permitting) at Storm Mountain Park, 11400 South 1000 East. Bring the whole family to see the balloons fly and at dusk on Saturday enjoy food and entertainment and the glow of the balloons. On Saturday evening, 8:00-10:00 p.m., the festivities move to the South Towne Promenade in front of Sandy City Hall, 10000 South 173 west with the balloon glow beginning around 8:30 p.m. Tasty food choices will be available for purchase as well as an evening of entertainment. Lastly, some pilots may need volunteers to help crew their hot air balloons. Come early, find a pilot that needs help and experience the thrill of helping crew a hot air balloon. For more information, visit Sandy Hot Air Balloon Festival. Every Saturday evening through Labor Day, Butchart Gardens in Victoria, BC features Saturday Night Fireworks. The shows, which first started in 1977, continue to be the Gardens’ most popular activity and feature jaw-dropping, dazzling fireworks with both aerial and ground displays choreographed to showtunes. After the show linger a while to enjoy the Night Illuminations and a half hour live recital from the rare Aeolian Pipe Organ situated in the loft of the Organ Pavilion. The gardens are open daily 9:00 a.m. to 10:00 p.m. and the firework show starts at 9:30 p.m. General admission is $31.45 per adult and gives you access to all of the gardens and includes access to performances on the Concert Lawn and Firework Saturdays. For more information, visit Butchart Gardens. The Houston Shakespeare Festival, a professional project of the University of Houston, is a two-week event where you can catch performances of Shakespheare’s Macbeth (July 31, Aug. 2, 4, 6, 8) and The Merchant of Venice (Aug. 1, 5, 7, 9) depending on the night. This is a ticketed event for the covered seating area. Free tickets are available (4 per person over age 16 while they last) at the Miller Outdoor Theatre box office the day of the performance between the hours of 10:30 a.m.-1:00 p.m. If tickets remain at 1:00 p.m., the box office will re-open one hour before show time to distribute the remaining tickets. As always, open seating (non-ticketed) is available on the hill above the stage. For more information visit Miller Outdoor Theatre. WASHINGTON DC: The National Museum of American History – Food Fridays – Friday, August 7. Visit the Smithsonian for details. 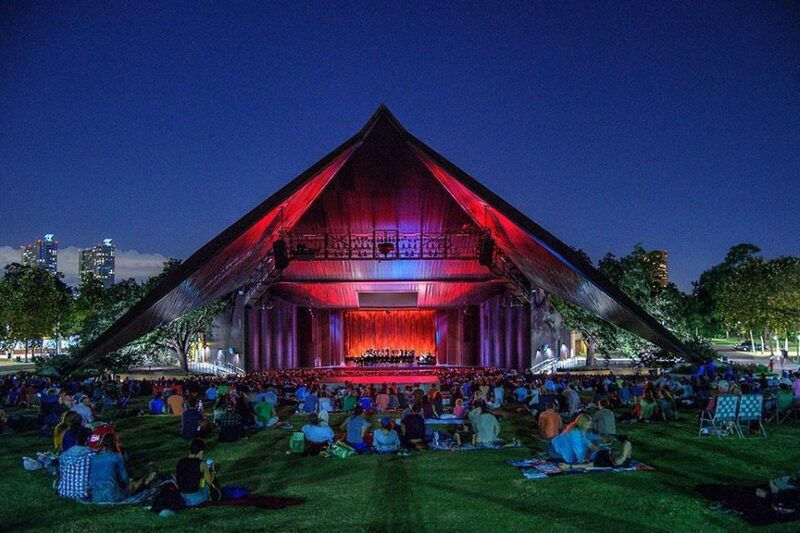 Featured Image: Houston’s Miller Outdoor Theatre. Image courtesy of the Miller Outdoor Theatre.